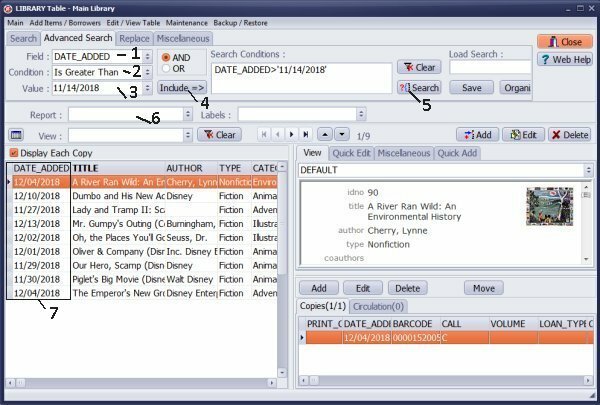 ﻿ Handy Library Manager: How to print library items catalogued in the last month? Help, how to topics > Print reports > How to print a library list report with items that were added in the last month or week? How to print a library list report with items that were added in the last month or week? Very often library users would like to know what the new additions in the library are. 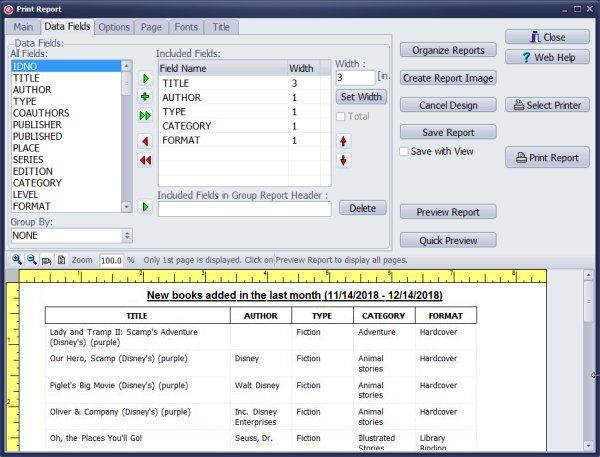 With our library software you could quickly create a simple list report with books that were added recently. In this sample we will show how to create a list of books that were entered in the last 30 days. When item is entered into our system the software creates automatically the DATE_ADDED value (record entry date). The new library items report will be created in two steps. In the first step we will define the search (display only new items). In the second step we will define the report layout. At the end of this topic there are instructions how you could design a generic report, save as a template, and run it regardless of the execution day. 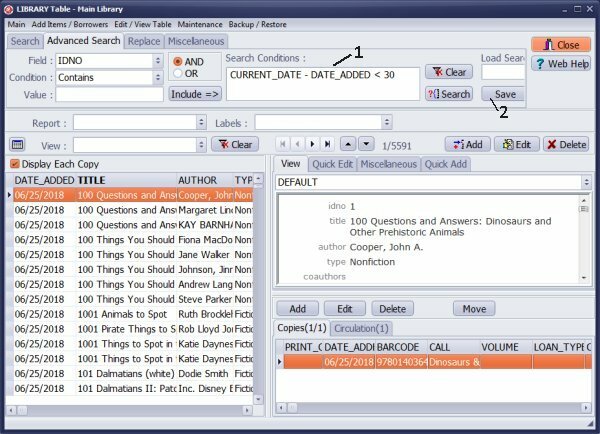 Open the Library Main Catalog window. On the Advanced Search tab define search condition. Select DATE_ADDED in the Field (1) box, select Is Greater Than in the Condition (2) box and select the date in the Value Equal (3) box. Click Include (4). Click Search (5) to execute. Only items that were added in the last month are listed (7). In the Report (6) box select NEW REPORT. 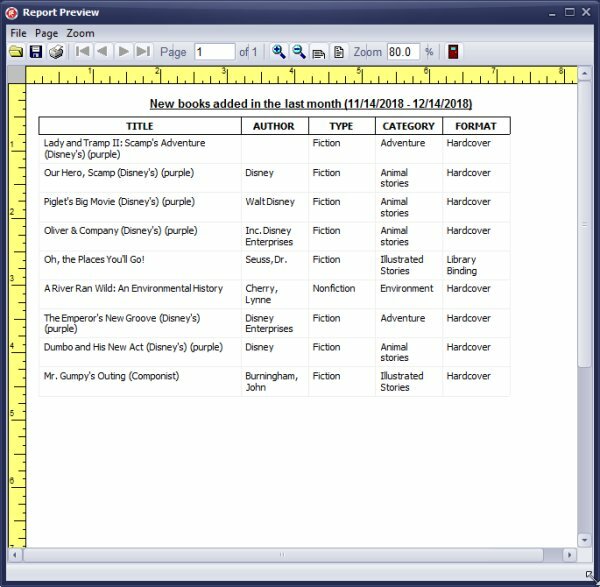 Print Reports starts with 3 preselected data fields, click the Red Arrow icon to remove them. Scroll down and up in the All Fields box and select the following data fields: TITLE, AUTHOR, TYPE, CATEGORY, FORMAT. When data field name is selected in the All Fields box click Green Arrow icon to include it in the Included Fields box. To adjust the column width select the field in the Included Fields box enter the column width and click the Set Width button. Click the Preview Report button to review the report. Review the whole report in the Report Preview window. Close the preview and click the Print Report button to print. If you run the new library items report every month or every week you can automate the search and report procedures. The search query has to be entered manually. In the search definition you can use CURRENT_DATE function (returns today date). CURRENT_DATE is the SQL function (Firebirds's SQL). When this query is executed it always displays items that were added in the past 30 days. Click the Save (2) button to save the definition as a view for future use. In the View (1) box select the newly created view (last month new items). Question: How can we print off a list of new resources added? How to print off reports (eg. patron usage, number of books in collection, resource lists added since a specific date, etc.)? Answer: The above topic explains how to print: a list of new resources added, resource lists added since a specific data. To create patron usage report please review: circulation report by item, how many times the resource was checked out, transactions per month, loan transactions per borrower. Items catalogued in the last month report, items catalogued in the last week report, new books in the library. How to define a query that displays only newly catalogued library items?